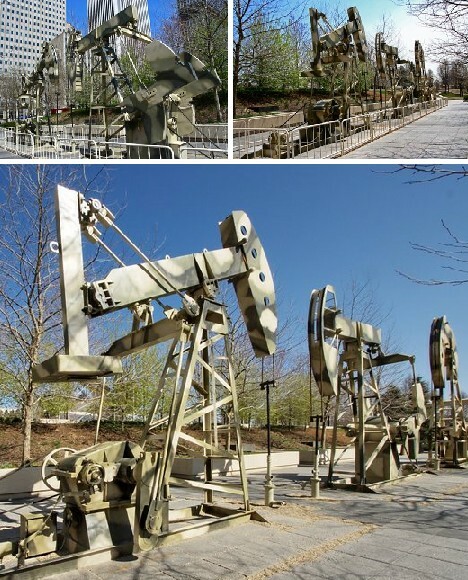 Mechanical “nodding donkeys” have been grazing the surface of uninhabited oil fields for many decades but in urban settings they can look, well, crude. Making these horsehead pumps look certifiably “citified” often involves local folk art projects that produce unique and even surprising results. Pimp my pump jack? You know the drill. Most pump jacks show a family resemblance no matter where they’re located or who manufactures them. This is due to the “walking beam” mechanism that takes a form-follows-function design ethos. 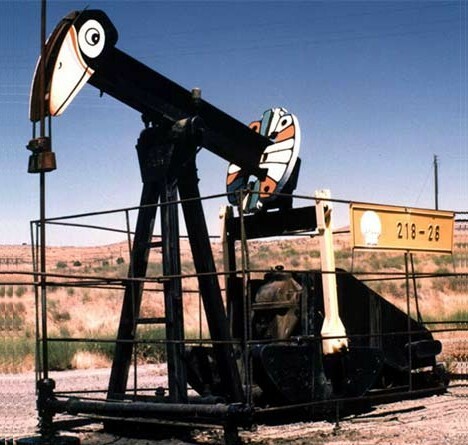 Call them nodding donkeys, horsehead pumps or thirsty birds, pump jacks are designed to do one thing and do it repetitively: extract oil from wells where pressure alone isn’t enough to bring oil to the surface. 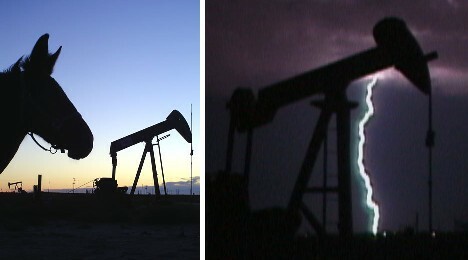 The pump jack above appears to have sprouted a pair of insectile antennae. You’ll find it on display at the New Mexico Institute of Mining and Technology in Socorro, NM. Setting up a bright & colorful holiday display? Why not work the local pump jacks into it – makes celebrating the season a much more “moving” experience. Just ask the nice people of Lufkin, Texas. 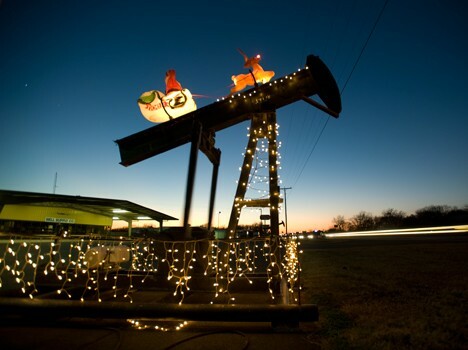 Lufkin’s an oil town… just ask the Mark II 640D pump jack dressed up as Rudolph the Red Nosed Reindeer in the following video, it’s made by Lufkin Industries. You can find it in the parking lot of the Lufkin Mall in downtown Lufkin. 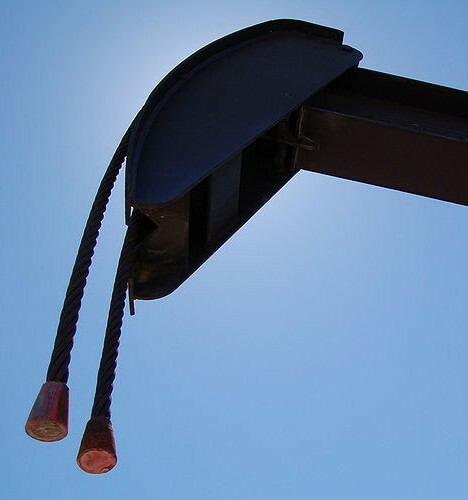 Drop in to the Texas panhandle town of Borger and you’ll find a classic combination of friendly people and hard-working pump jacks – or is it friendly pump jacks and hard-working people? 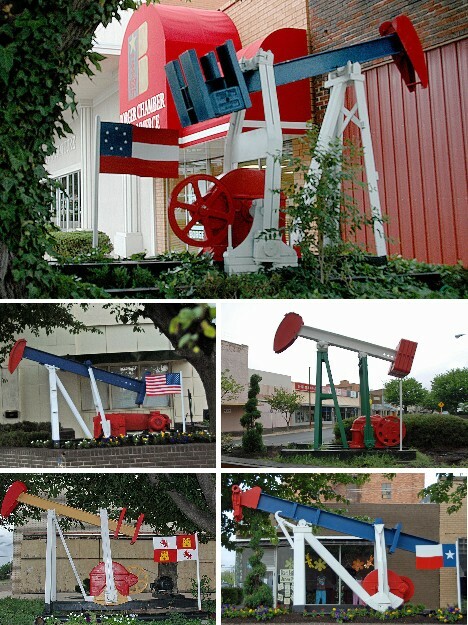 I’ve had the pleasure of visiting Borger a number of times in the late ’70s and early ’80s, and I recall being awed by the the red, white & blue, All-American pump jack just outside the Borger Chamber of Commerce. Since then it seems there are others scattered about the town; the ones shown above each proudly bear the colors of a nation whose flag once flew above what is now Texas. 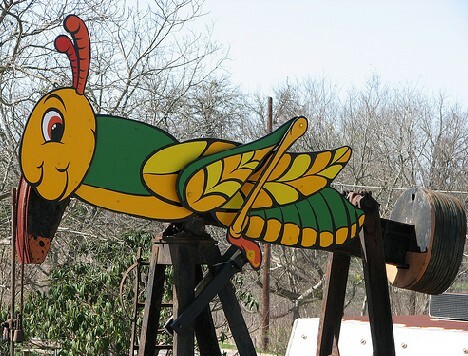 Not to be outdone is the town of Luling, Texas. This small town of 5,000 is blessed with nature’s bounty both below ground and above – oil and watermelons, to be exact. 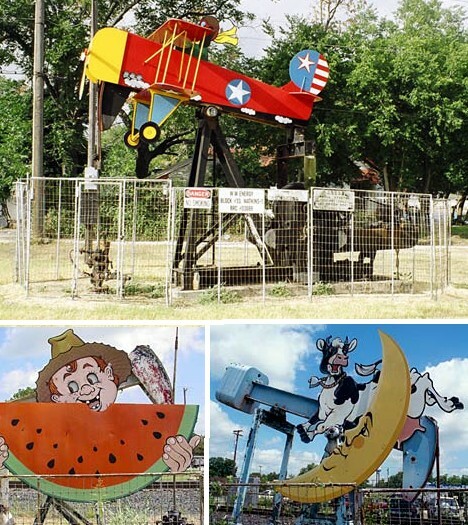 To show the world what Luling’s all about, town authorities had a 154 ft high water tower painted up like a watermelon and affixed colorful painted plywood cutouts to many pump jacks nodding away within city limits. Even the bugs! A swarm of locusts, each this large, would certainly be a plague of biblical proportions. 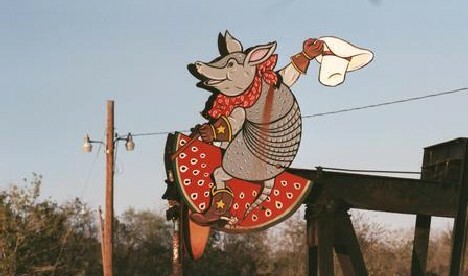 Luckily the smiling beastie above is firmly attached to a Luling pump jack AND he’s the only one of his kind. Amen to that. 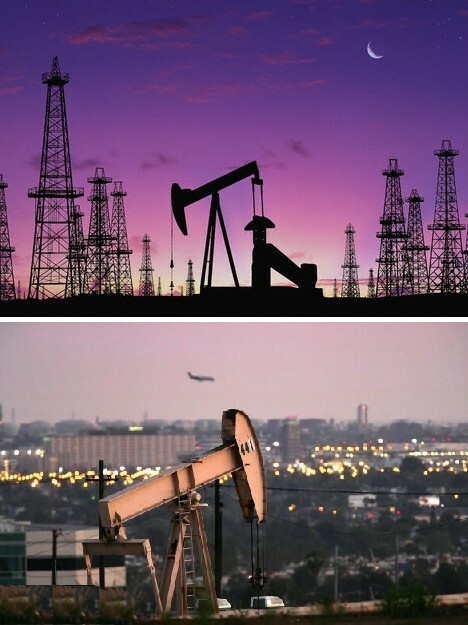 Nodding donkeys can be found wherever oil lurks underground. 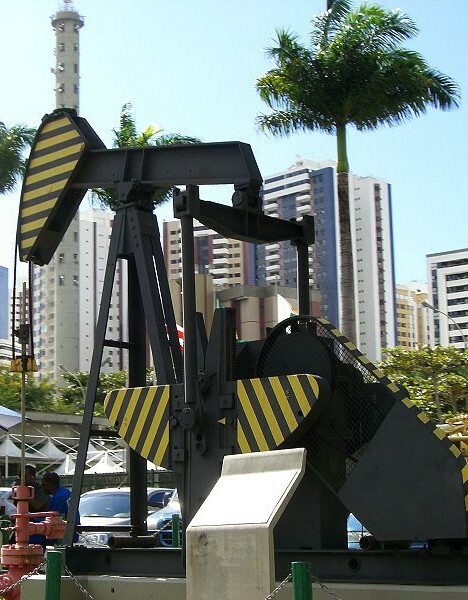 Take the patriotic Petrobras pump jack above, located at the Federal University of Rio Grande do Norte Campus in Natal, Brazil. It isn’t easy to keep pump jacks looking as nice as the day they were assembled – blistering sun and pouring rain take their toll on paint and metal. 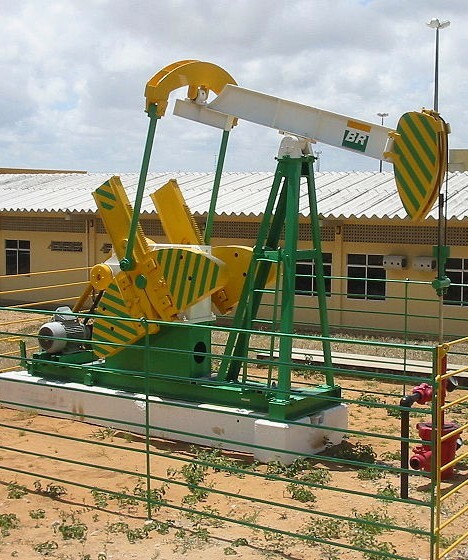 This particular pump jack shows signs of TLC, right down to the color-coordinated fence that surrounds it. 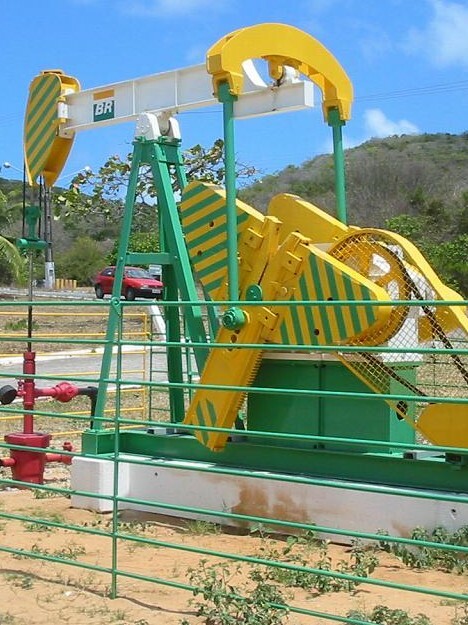 How many pump jacks are there in South America? At least a Brazilian! This nattily striped pump jack in Salvador, Bahia, nods slowly to and fro while traffic speeds back and forth along the city’s wide avenues – original source and end users, side by side. One wonders what would happen should an out-of-control car or truck take out the pump jack… maybe that’s why it looks a lot like a road construction sign. 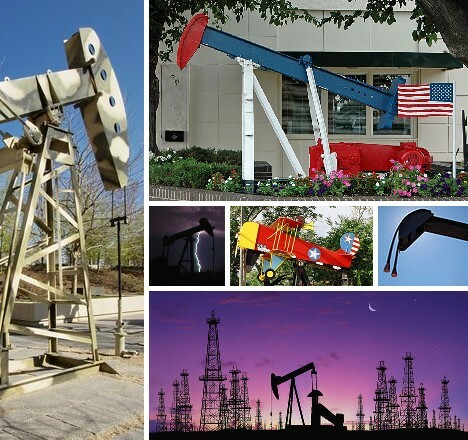 The pump jack above top, painted up to look like a smiling toucan, resembles those glass novelty items partially filled with colored alcohol that bob up and down… but you knew that. Is it any wonder one of the nicknames for pump jacks is “thirsty bird”? 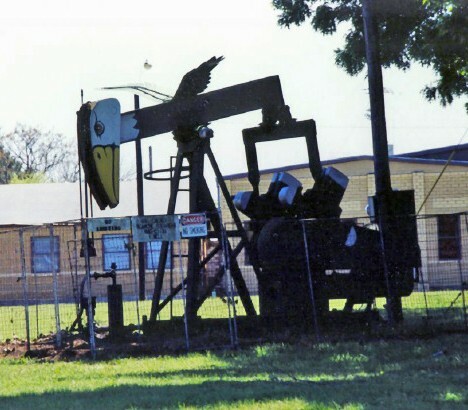 Just below it is another pumpjack from Luling, TX, sporting the distinctive plumage of the American Eagle. Sometimes the temptation to soften, even anthropomorphize, our rough-edged mechanical servants is resisted and when that happens the results can be surprisingly pleasing. Though we may live cheek-by-jowl with the tools of our technological success, the jarring concurrence of urban & industry can take on an almost artistic flavor – something even a nodding donkey can appreciate.